The Honda Grom is everybody’s favorite fun-sized 230-pound motorbike. Industrial Moto is a motorcycle customization shop with a cool retro-futuristic cyberpunk aesthetic, and its latest creation is this cute little adventure sidecar for the bitty bike. 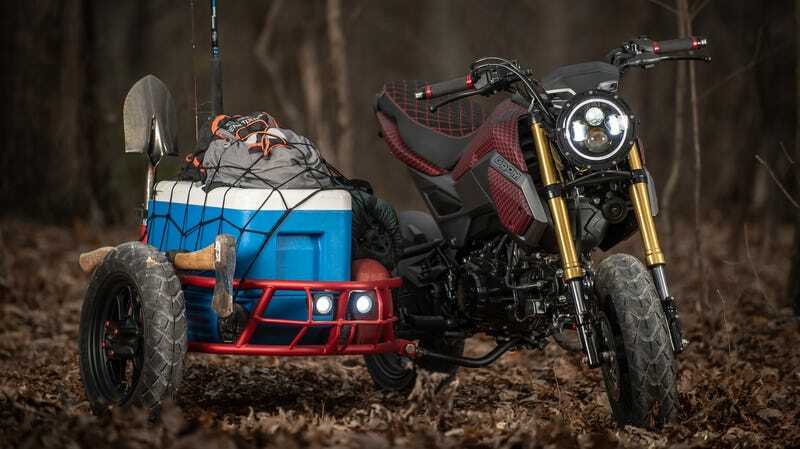 This adorable thing has been making rounds on the Internet this week and I could’ve sworn it was a digital render based on the photographs, but no, the Grom Utility Sidecar (also known as “Project GUS”) is something you can actually buy for $1,600 to $1,920 from the Culpeper, Virg. based shop. Practical benefits include: room for a cooler, fishing pool, sleeping bags and shovel, or a child, whichever comes first, on your Grom! There doesn’t seem to be much to the sidecar itself, but the design is definitely clean. I’m not quite sure how this accoutrement would affect the Grom’s handling. Adversely, obviously. But you would probably be having too much fun hauling whatever around to worry about that anyway. Industrial Moto’s “About” page makes it sound like they’ll cook up pretty much any kind of custom bike project imaginable, and I couldn’t help but notice they used International Scout badges on one of their builds. Nice. I would love to hear what this Grom, or any of Industrial Moto’s other bikes, are like to ride, so if you’ve been on one drop me a line!